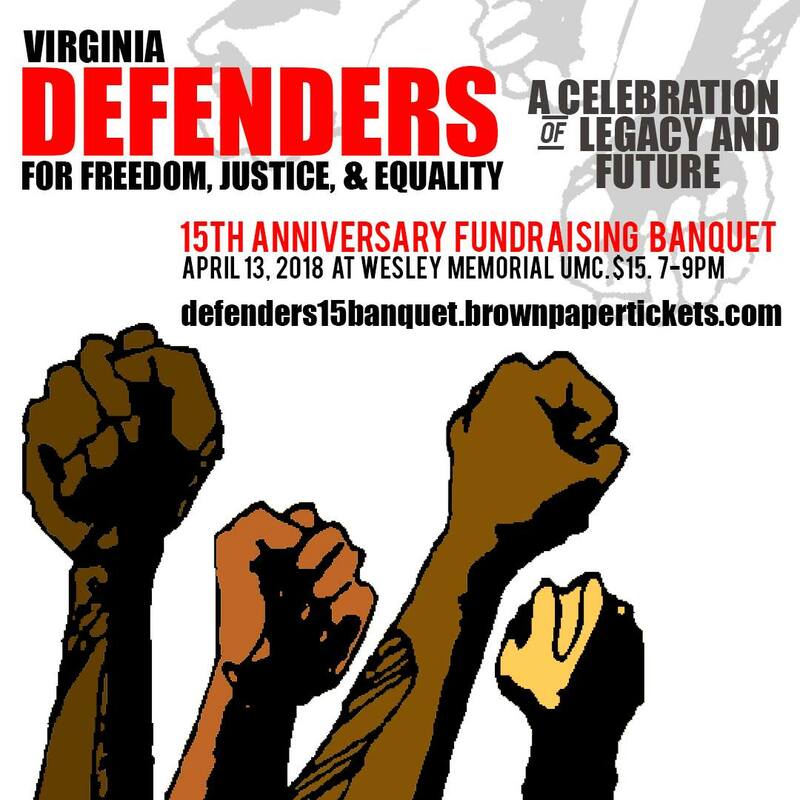 The Virginia Defenders for Freedom, Justice & Equality is an organization of Virginia residents working for the survival of our communities through education and social justice projects. The Defenders recently celebrated 15 years of community organizing and activism! We began in June 2002. Many of us had relatives in the Richmond City Jail or state prisons and were concerned about the physical conditions of these institutions. As we worked around these issues, we learned more and more about the connections between jails, jobs, poverty, racism, sexism, homophobia, class, political representation, and war. We began organize and hold public forums on these issues, so we could develop more to show the connections between local and international events. We have The Virginia Defender, a statewide, quarterly newspaper; two websites (www.DefendersFJE.blogspot.com and www.SacredGroundProject.net); and three Facebook pages, for the Defenders organization, newspaper and radio program. Our members meet monthly to discuss issues and plan actions. We are affiliated with the Virginia People’s Assembly and the United National Antiwar Coalition. (UNAC) We also coordinate UNAC's Odessa Solidarity Campaign, which supports the anti-fascist movement in Odessa, Ukraine. If you agree with the principles below and want to work to make these ideals a reality, we invite you to join us. Together, we can make a real difference in the life of our communities. Just contact us at DefendersFJE@hotmail.com or call 804-644.5834. We believe that all people must be free to develop to their full potential as human beings. We must be free from hunger, from preventable diseases, from homelessness, from ignorance. We must be free to work and provide for ourselves and our families. If we are unable to work, we have a right to support that allows us to live in dignity. We must be free to pursue our education and to develop ourselves culturally and spiritually. We must be free from fear of the arbitrary use of police power and from the physical and cultural attacks of white supremacists. Women must be free from physical, cultural and emotional oppression. Children must be free from dangers like lead poisoning, asthma and sexual exploitation. Our youth must be free both from police harassment and the mindless violence of the streets. We must all be free from unjust wars fought in the interest of the wealthy few at the expense of the struggling many. We believe that every human being has the right to life, liberty and the pursuit of happiness. And we believe that these rights are meaningless unless we also have the right to a job at a living wage, to decent housing, to adequate health care, to a meaningful education. We believe that all people have the right to stand equally before the law, to equal and fair treatment by the police, by the court system and in jails and prisons. And we believe that the death penalty is the ultimate exercise in injustice. We live in the richest country in the world. But it’s a country that owes its tremendous wealth to the barbaric oppression of Black labor on a historic scale, as well as the theft of American Indian and Mexican lands, the cruel exploitation of Asian labor and the labor of waves of poor European immigrants. This country does not belong to the wealthy few who have claimed it for their own. As human beings, we all have an equal right to its resources. The descendants of those whose blood, sweat and tears paid cruelly for its development have a right to collective reparations and, as people who struggle every day with ongoing inequality, the right to affirmative action. We believe that for any one of us to be free, we must all be free. We believe that for any one of us to have justice, we must all have justice. We believe that equality for anyone is impossible without equality for everyone. As members of the Defenders, we pledge ourselves to defend our community, its women, its men, and especially its children, from all forms of oppression. We pledge to fight for a world where all people can live in dignity, freedom and peace.